At lunchtime it dawned on me – I am halfway through my $2 a day challenge. Yeah! Today I remained much less hungry than on day one, but my enthusiasm is waning a bit. My appetite for morning porridge with sugar but no milk is not as strong as on day one. I was still eating it slowly all morning, not finishing it until after lunch and forcing myself to eat it. Lunch was leftover caramelized onion tart. I noticed as I ate it two things. One was that I am becoming more mindful with my food: taking small bites, experiencing the flavours and letting the experience last. The second is that I noticed how incredibly rich the buttery shortcrust pastry was. Perhaps I had been wasteful using up so much butter and eggs so soon in the challenge? Workmates remain curious about the $2 challenge, and today two more people donated to my cause. Others are asking about it. It feels good to be supported in this challenge, and to know that people respect what I am doing. 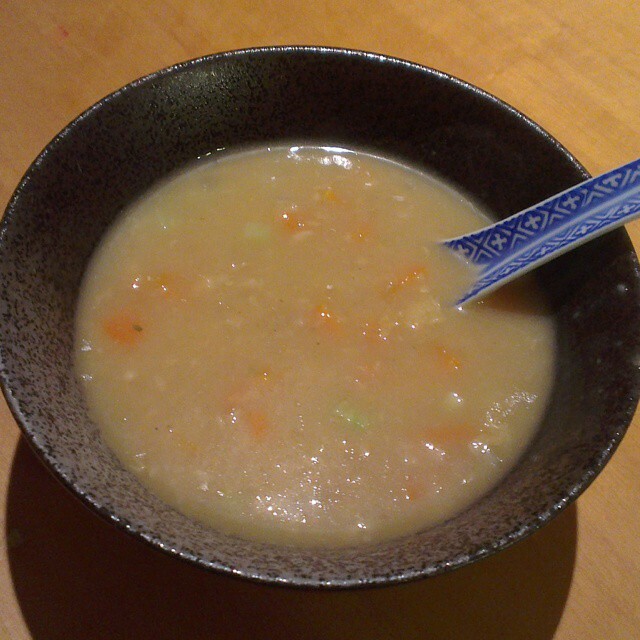 Dinner was a simple meal of vegetable soup, with some French onion soup base and thickened with oats. Oats do quite well with soup, I have discovered. While making dinner for the kids (mine only needed reheating), I also started making carrot fettuccine for dinner tomorrow night. The pasta dough is resting in the fridge ready to be rolled out tomorrow night. I am not sure how it will go after a day (optimally best after an hour or two), but I will be too hungry tomorrow night to wait. I am hoping it won’t be a complete disaster as I am now running low on supplies.